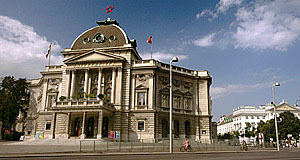 The Volkstheater was built in 1889, based on designs by the architect Hermann Helmer and Ferdinand Fellner. It is located in the 7th district or Neubau, just next to the MuseumsQuartier - the new museum district of Vienna. With the Viennese fondness of superlatives (every self-obsessed capital has that, but it is particularly pathetic in the case of Vienna), it is often said to be the "biggest theatre in the German-speaking world". This depends, of course, on various criteria that one can use for measuring the size of a theatre - seats, space, surface, square metres of stage. It is certainly true, though, that the Volkstheater is remarkably big for a 19th century theatre. Originally, it seated 1,900 people; after WWII, however, this number was reduced to approximately 1,500 and today, the Volkstheater has space for only 970 people. So if you take the number of seats as a criterion to judge, the Volkstheater is not even the biggest theatre of Vienna, but ranks as number two after the Burgtheater. The Volkstheater was founded by a society that was originally chaired by the poet Ludwig Anzengruber and the entrepreneur Felix Fischer. There were two main motives that led to the foundation of the society: The gaining self confidence of Vienna′s new upper class - especially industrialists and entrepreneurs. They did not feel home at the Burgtheater, where the Imperial nobility and aristocracy attended the theatre. The other reason was a growing cultural awareness of the German part of the Empire′s population, often closely related to the booming nationalism of these days. Therefore, the new stage was named "Deutsches Volkstheater" - the theatre for the German-speaking people. The first honorary president was Franz Thonet, an industrialist that owned a chair factory - the one that produced the legendary Viennese café chairs. The Volkstheater is a sibling to the Hamburger Schauspielhaus, which is find very funny, because I often see similarities and analogies between Hamburg and Vienna. This is only one of many - interestingly enough, I do like Hamburg, whereas I dislike Vienna. Opening of Vienna's "Burgher's Theatre"
The opening performance was done in 1889 with a play by Ludwig Anzengruber. The playwright is considered to be a late representative of the Wiener Volkstheater - in this context, it refers to a specific type of peasant play that developed out of carnival plays in the early 19th century. In the 1920ies, the Volkstheater became hugely influential for the drama scene of the German-speaking world (like other theatres of Vienna). During the Nazi years between 1938 and 1945, the theatre was used by the German leisure program "Kraft durch Freude" ("Power through Joy"). For that purpose, the building′s architecture was slightly altered. In 1944, the building was hit by a bomb, for which I can′t really feel sorry due to my disliking of the historicist crap that spoils Vienna and much of the rest of Austria. Instead of using the bombardment as a starting point for building something new, the Volksoper was fixed after the war and - after removing the politically sensitive "Deutsches" from the name - re-opened in 1945. Since 1954, the Volkstheater does touring stage productions that are performed in the outer districts of Vienna. The 1970ies were a new era in the history of the Volkstheater, with great innovations of Austrian drama emerging from its stage. Peter Turrini and Wolfgang Bauer are two prominent names from this time. The "Hundsturm" theatre is a small side-stage for experimental plays that is maintained by the Volkstheater. Something unusual for an Austrian theatre is that it is privately run by a foundation and financially supported - but not owned - by the City of Vienna and the Federal Republic of Austria. Attractions nearby include the MuseumsQuartier, the Spittelberg area, the Houses of Parliament, the Naturhistorisches Museum, the Kunsthistorisches Museum, Justizpalast, Palais Trautson and the Hofburg. Most attractions of the Ringstraße or the first district are within walking distance.